Split pea soup has always been one of my favorites and one that does not get made too often, at least in my house anyway. traditionally it was always made with a ham bone to get the flavor from, which we never really have around this house very much. Secondly, Michelle has never been a big fan of pea soup, so I had stayed away from trying to make it. Recently she said I should give it a try since she knows how much I like it and she might feel differently about it now. Since I still did not have a ham bone to make it with, I went hunting for alternatives. I saw a lot of recipe that simply used bacon or ham steak as a replacement, but I wanted a bit more flavor than that. I immediately thought of ham hocks, but my local store did not have any. However, they did have some smoked pork necks and this seemed like it would work well enough so I gave it a try. Bring a large saucepan three-fourths full of water to a boil over high heat. Add the ham hocks or pork necks and simmer for 1 minute. Drain and set aside. Pick over the split peas and discard any misshapen peas and stones. Rinse the peas and drain. In a soup pot or Dutch oven over medium heat, melt the butter. Add the onion and carrot and sauté, stirring occasionally, until the vegetables are soft, about 10 minutes. Add the ham hocks, split peas and the 8 cups of water or stock. Bring to a boil, reduce the heat to low and simmer gently until the peas are soft, about 50 to 60 minutes. Remove the soup from the heat. Remove the ham hocks and let them stand until they are cool enough to handle. Let the soup cool slightly. Using a blender and working in batches, puree the soup on high-speed until smooth, about 2 minutes for each batch. Return the puree to a clean soup pot. Alternatively, process the soup with an immersible blender in the pot. Thin the soup with more stock, if needed. Place the soup over medium heat and reheat to serving temperature. Season with salt and pepper. While the soup is heating, remove the meat from the ham hocks and discard the skin and bones. Cut the meat into small pieces and add to the soup. Stir to heat through. To serve, ladle the soup into warmed bowls and serve. I think the pork necks worked out really well and gave the soup a nice, smoky flavor that I really enjoyed. The soup thickened up nicely and tasted wonderful and there was just enough left over for me to have some for lunch today. It went really well with the Filipino sweet rolls that I made to go with them, but you could just as easily make some croutons to top the soup with also. As you can tell from the picture, I like to put a lot of pepper in my soup :). That’s all I have for today. Check back next time for another recipe. I still have a backlog of items from the holidays to share so I’ll be sharing more of those over the next few days. Until next time, enjoy the rest of your day and enjoy your meal! 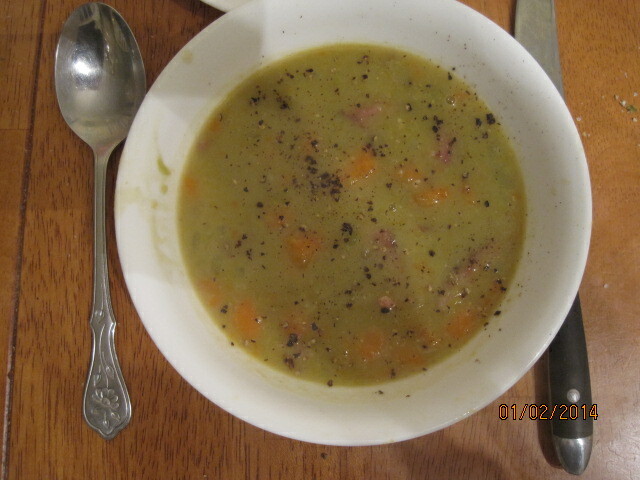 I’m a big fan of split pea soup too, pancetta is anther great option for the ham! I agree with you – In Stockholm you can’t find it everywhere, in DC it’s easier though… 🙂 But what’s great about soup is that there are endless possibilities . Thank you so much! That means a lot.